I really enjoy just getting the “bits and pieces” type glimpses into Destructor’s powers – the mystery empowers the awesomeness of each new reveal… so without spilling any beans.. can you perhaps compare the totality of Destructor’s power level and hidden abilities with other sci-fi/fantasy/comic robot/armor-esque guys we’re familiar with? Like… is he on a Darth Vader-type level? Optimus-Prime? Galactus? etc… or would he just kick all those guys’ arses? This is a fun question, so please allow me to be serious about it instead. I’ve been following Marvel editor Tom Brevoort’s Formspring account for a long time now, and partisans of various characters frequently ask him questions of this sort. Could Thor beat the Hulk beat the Sentry beat Superman beat Jean Grey beat Galactus beat Odin beat the Silver Surfer beat whoever? Oftentimes the questioners will cite seemingly contradictory cases: “Character X beat Character Y, and Character Y beat Character Z, but Character Z beat Character X? Isn’t that inconsistent?” Brevoort’s reply tends to be something to the effect of varying circumstances yielding varying results. Fans, he’s said, approach these conflicts as though the stats and the W-L record do all the fighting themselves, but if that were how it really would work, there’d be no need to have the fight — you’d just “know” who’d win. But that’s ridiculous. If things worked that way, there’d be no need for professional sports teams to actually play one another — they could simply brandish their existing stats at each other, and then we’d know who’d win any given game. But of course it doesn’t work that way, and there are upset victories and bottom-ranked teams who beat the best in the league every now and then and so on. So my answer to you is this: I don’t know who he’d beat. (Okay, probably not Galactus.) I don’t know who’d beat him. There are too many variables at play. I do know that he’s considered The Most Dangerous Man Alive, and he didn’t earn that sobriquet for being easy to defeat. Generally speaking, I think it would be unwise for most people to challenge him directly. (The Croc Champion learned that lesson the hard way.) That said, so far we’ve met at least three characters I know he’d be hesitant to take on mano a mano. That’s not to say he’d never do it, and it’s not to say he wouldn’t come out on top if he did, just that they’re powerful enough to give him pause. Remember, everyone, we’re happy to answer any questions you leave in the comments! What detail of direction is given when writing Destructor? Any chance you can post an example of a script already published? As we said earlier, I tend to have a pretty clear idea of how things should look and go, and thus the scripts are fairly detailed. That said, I am not an artist, and as far as I’m concerned I’d be stupid to try to do Matt’s job for him, so I tend to trust his instincts even if I’d originally pictured something differently. Certainly his use of color is not something I could have ever conceived of on my own; I just don’t think of color as one of the primary tools of comics storytelling, sad to say, and in his hands it’s much less of a supporting player than it would be if I could suddenly draw this stuff myself. The funny thing about my Destructor scripts, and I don’t really know why this is, is that I vary the format considerably from story to story. The actual document is lost to the ether now I’m afraid, but if I recall correctly, the script for “Croc-Town” was just a big block of text summarizing the events of the story. “Prison Break” and a future strip were broken down by page, but not panel by panel. “Destructor and the Lady” plotted out the whole story beat by beat, but with no page or panel breaks — I left that to Matt. A pair of future stories were done in traditional, full-script format: “PAGE ONE, PANEL ONE,” that sort of thing. Comics scriptwriting, to me, is at best a means to an end, a tool used to create the finished work, not a work in itself, so you use whatever tool comes easiest to you in the moment. At worst, it’s the obstacle your ideas need to climb to get from your head and into your artists and thence to the page, so you do whatever you can to make that journey as swift and simple as possible. At times that’s meant blocking everything out, at other times it’s been close to the old Marvel Method. It changes nearly every time I sit down and start writing. To give you an example, here’s the “script” or “plot” or “breakdown” or whatever you’d want to call it for the portion of “Destructor and the Lady” we’ve seen so far. You’ll note a few passages in brackets — those are revisions I made once Matt had started drawing the first few pages. You’ll also note that some of the best moments, like Destructor using his fist of flame to melt the ice rather than blast through it, were Matt’s invention. Close-up on Destructor’s feet, pounding one after the other on a sea of frozen snow. He is running full tilt. We rise to see his armored body, lightly frosted with snow, with some icicles forming here and there. He looks over his shoulder at his pursuers. In the far distance, we see something smoldering–a crashed air pod, perhaps–with smoke rising in a plume into the sky. Nearer to us, and to Destructor, is a large mob of pursuers silhouetted against the bright arctic sun. We can’t tell who they are or what they look like from this distance, but the vague sounds that drift across the frozen plain are threatening. Destructor turns and increases his speed. He soon finds himself mounting a large hill of some kind. Perhaps it is the furthest reach of the distant mountain range he is running to. But as he continues to climb its precarious banks he realizes it is made entirely of ice. Soon he looks back at his pursuers. They are gaining on him thanks to the difficulty of his climb. He’s a marked man all the way up there, but he has no choice. He reaches the top of the ice hill. He is about to plow on by and run down the other side, hoping to put some more distance between him and his pursuers, when suddenly he stops. Something has caught his eye. Embedded in the ice is a gleaming silver-blue shield. Its design is simple and the only marking on it is a picture—really more of a hieroglyph, almost—of an extremely simplified and stylized sword crossing an equally pictographic bone, like an X. The sword appears to have broken the bone in two. Glancing back at his pursuers, Destructor realizes this shield may come in handy. He reaches to pull it out from the ice. As soon as he does so, a bright blue burst of energy flashes, and the ice on which he is standing collapses, taking him and the shield with it with a crash. Down he falls into darkness, down down down far below the summit of the icy hill, until he reaches some sort of membrane-like barrier seemingly made of blue flame [see above]. The barrier forms a dome-like shape. It briefly cushions his fall as he bends it inward. Then with a POP! he punctures it and falls through, another thirty feet or so to the ground. The shield, which slid into the dent he made in the barrier, falls after him and lands next to him with a CLANG. At one end of the chamber, which is roofed by that blue membranous barrier and walled by the ancient hill of ice, there is the skeleton of a man in chainmail and arctic gear, sword at his side. He is wrapped in several now-tattered animal-skin blankets. Clearly he has been dead for a long, long time. Barely visible on his raiment is that same sword-and-broken-bone symbol on the shield Destructor found. Destructor walks over to the corpse to examine it. He reaches for the sword and holds it aloft. It’s then, in a reflection on the sword’s shiny blade, that he sees he and the corpse are not alone. Whipping around, he turns to see who is at the other end of the chamber: A beautiful, naked woman. Pale, extremely gaunt, dark eyes, long dark hair. She has been cruelly chained to the floor of the chamber. Strategically placed hair and chains cover her where appropriate. She is definitely still alive. Well, “alive.” She and Destructor make eye contact, and she nods her head in greeting. After a dazed pause, he quickly thinks to help her. Dropping the sword, he turns and grabs a big blanket from the skeletal corpse—a guard, most likely—in each hand. Approaching her, he reaches out his hands with them. “Thanks,” she responds. He hands her a blanket and she wraps it around herself, chains clanking. Looking at her would-be rescuer, she reaches out and touches him, her slender fingers brushing his metal face. Destructor reaches out, encircling her tiny wrists and the steel cuffs that encircle them. She points across the chamber. Destructor turns, and for the first time he notices that behind the body of the guard is a tiny antechamber, more like an alcove or a small slit recess in the rear, its entrance sealed with ice and almost impossible to see due to the frost. Destructor walks to the end of the chamber. Kicking aside the corpse of the guard, he brushes away some of the frost and snow/ice particles from the frozen wall. Inside he can barely see what appears to be a pedestal, with a mask of some sort sitting on top of it. He gives the ice a sturdy knock with his fist. It’s rock-solid. He stands back and points his arm straight at the wall, his hand a fist. A blast of energy fires out of his fist and shatters the ice wall with a CRSSSSH. Destructor looks inside. Resting against a round stone is a death mask in the shape of a skull face. Atop the round stone is a silver tiara-like crown. He grabs both and walks back to the Lady. He hands her the crown, which she puts atop her head. Almost immediately she looks more regal, more powerful, more dangerous. She speaks, but her eyes look distant, as though she is talking not to Destructor but to herself. She turns and looks at Destructor. He hands her the skull mask. She takes it and puts it on. INSTANTLY—like, one panel she’s one way, the next panel she’s different—upon putting on the mask, she is transformed into a living skeleton. Her gaunt flesh is gone, bones in its place. In her eye sockets dances a remote, gleeful fire. Her crown shimmers, the animal skins cling to her bones. It’s not that her living human face is now wearing a skull mask—her head has become a skull, her body is just bones. Hopefully this will look really creepy and unnerving. I hope that answers your question, FbP. And remember, everyone, if you’ve got a question, ask it in the comments and we’ll answer it as best we can! Could you guys post your Destructor playlists! Either what you listen to when you write and draw, or what you’d think would make great soundtracks for readers? Matt: The coloring is generally done to about 50-75% old episodes of The Joy of Painting with Bob Ross. Sean: That explains the happy little croc-men. For my part, I tend to listen to one or two albums over and over while writing a story. In the case of “Destructor and the Lady,” that album was Music Has the Right to Children by Boards of Canada. One upcoming story used Two Suns by Bat for Lashes, another …And Justice for All by Metallica and Sisterworld by Liars. Those two more aggressive albums were used to get me into a very specific mindset, though. In general, though, the retrofuturism of that Boards of Canada record, especially songs like “Telephasic Workshop,” “Kaini Industries,” “Bocuma,” “Roygbiv,” and “Olson,” is where Destructor lives; see also “Coconut” by Fever Ray, “Stress Waves” by Oneohtrix Point Never, and “Blue Calx” by Aphex Twin. Beat you to it! We are always happy to receive fanart, and once I have enough I’ll give it its own special page on the site. What’s the collaboration like in terms of character and environment design? I’m thinking specifically about Island Prison and The Lady. Are there design sketches done by Matt (that he could post)? Matt: Thanks for asking! Sean has pretty detailed environment and character notes in his script, and I generally do some sketching to figure out how things are going to look and (especially) how they’ll be staged, which I’ll send along to him if I have questions and want to make sure of something. I’ve got some stuff sitting around from Lady which I’ll put up in a later post; Not sure about Prison, since I drew that a while back, but I’ll put those up too if I can find the sketchbook(s) I was working in at the time. Sean: Matt’s right that I tend to have a clear idea of what people and places should look like — people in particular, since in many cases I’ve been drawing them myself since I was a child. When characters appear for the first time, Matt tends to send me his drawings up front just to make sure everything’s kosher. I rarely need to suggest any changes, but I do occasionally. My favorite was asking him to make General Grunt look less like a warthog and more like a bulldog, because there’s already a warthog-based character we’ll meet later on down the line. On a less ridiculous note, we had a fairly productive back and forth on the final look of the Lady recently. Did Destructor acquire his armor all in a single piece, or gradually over time? If he acquired it all at once, did it have a previous owner, or what it designed for him? Who made it? He did acquire his armor all at once. As for how, and when, and from whom, that is a tale for another time. Good morning, everyone–while I’m working to get the next page up, I thought I’d show you a little bit more of the sausage factory. Here’s the pencils for page two of “Destructor and the Lady:” …I generally build Destructor pages around three-tier racks of panels, because I find that structure is helpful for breaking down Sean’s script into a sequence of actions and shifts-in-perspective, which I think is key to making a Destructor story work. The dialogue is spare, and the characters are mostly either masked or nonhuman, so I have to be able to make it clear visually what a characters sees, knows, and is doing from moment to moment. 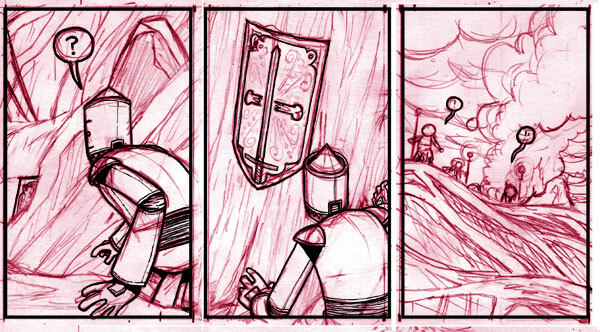 This bottom row, for example, I’d originally planned as two panels. 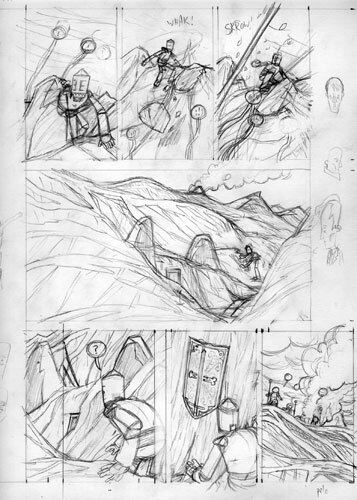 After I got the first panel pencilled, though, I decided that I needed an additional “beat” where we see Destructor’s pursuers cresting the mountain, as a catalyst for him grabbing the shield on the following page. I cropped the panel at left down to size (and really lucked out that I didn’t lose any vital info in the crop and therefore didn’t have to re-pencil that panel at all *(EDIT: Actually, I guess I slid that rock on the left over a bit so it would still bracket the left side of the panel, but still: not too much extra labor)), and added the third panel. After pencilling, I scan my pages in and “ink” them on a Wacom Cintiq monitor/tablet. I’d been doing most of my pre-Cintiq inking with Pigma Microns or Staedtlers, both of which produce pretty dead lines, so my inking comes out pretty much the same on the Cintiq as it would on paper. If I’d been using nibs or brushes, both of which have more “action” in them and are more dependent on tactile feedback, then Cintiq inking might have needed more adjustment on my part, but I wasn’t so, uh, it didn’t. Next time on the factory tour: more coloring stuff. His personality, his goals, and his motives come from me, I would say, along with his basic design and color scheme. But it was Matt’s innovation to give him that deadpan look, to lengthen his limbs versus his torso, to deploy his powers in slightly more subtle ways than I might have done myself — all things that strengthen our portrayal of this lone man. It’s a happy marriage. Do you have a question? Leave it in the comments and we will answer it! You may have noticed that our dispatches are being issued increasingly infrequently. For this you have our sincere apologies. The onset of convention season for Mr. Wiegle and the arrival of fatherhood for myself have made it difficult for us to maintain our weekly schedule. You will be seeing the resolution of Destructor’s encounter with the mysterious Lady, just not quite as quickly as we’d hoped. That said, perhaps I may still be of some use to you while we await the next page. 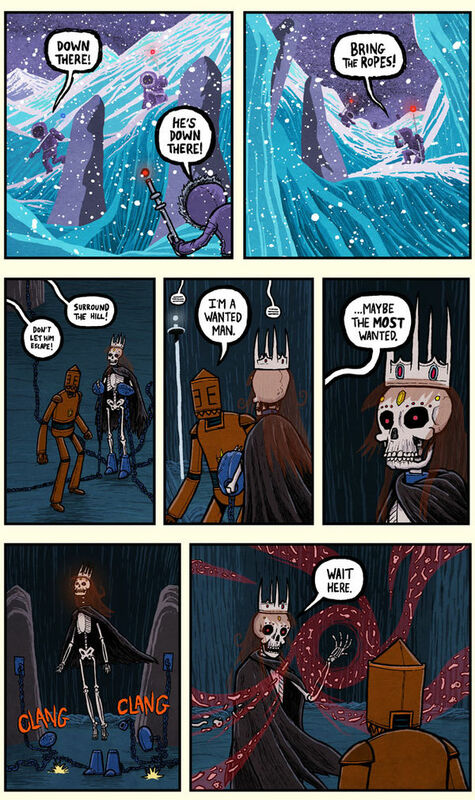 Do you have a question about Destructor the comic, Destructor the man, his world, or his humble chroniclers? Post it in the comments and I will answer it here on the blog, if it is within my power to do so. I look forward to speaking with you!